Our Room Treatment module is a convenient and easy-to-use tool for measuring the RT60 decay times of a room, and for trying out various materials virtually, to see their potential effects on the RT60 time of the room. 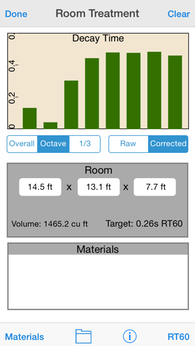 Use this tool as an estimator to determine what set of materials you might use to correct room reverb problems. The RT60 times are computed using an impulsive sound, using the algorithms developed in our advanced Impulse Response module. Materials from a group of participating manufacturers are shown, and in many cases you can even view details of the materials using information provided by the manufacturer. To begin, set the room size, by entering the length, width, and height of the room. The target RT60 time using an industry average will be shown, along with the volume of the room. To measure RT times, tap the RT60 button in the lower right corner. A recording screen will appear. Tap Record, and a 5-second countdown will start. When the countdown reaches 0, pop a balloon, clap your hands, or even fire a starter pistol. The sound should be roughly 1-2m (3-6 feet) from the microphone or iOS device. Wait for a few seconds after the sound for the decay to die down, and press Stop. Now you can exit to the main Room Treatment screen, and the results will appear. You can see the results in overall, octave, or 1/3 octave mode. 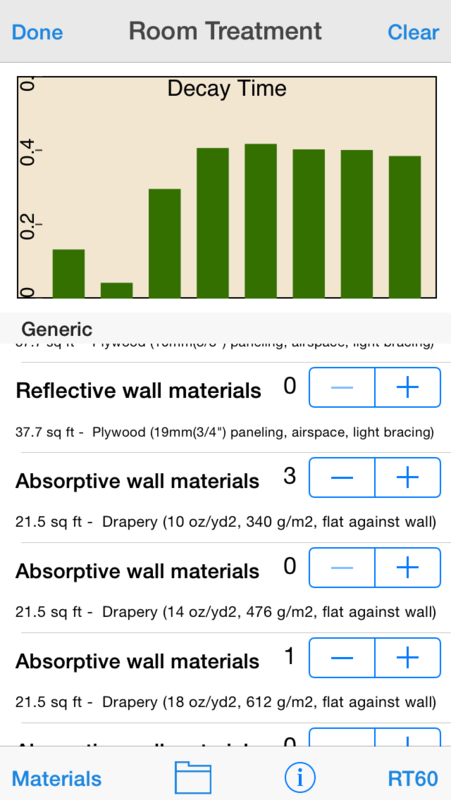 To apply materials to the room to see the effect on RT60 times, tap the Materials button, and scroll through the categories to find some interesting materials. Tap the category to bring up the list of materials. 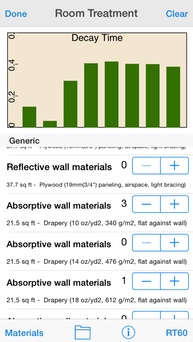 To try out a material, tap the + button to add one or more instances of the listed material. The effects on the RT60 times will be shown above, in real time. Add as many materials as you like, or tap the - button to remove materials. You can save your room, including all of the materials, using the folder icon and the normal Save / Recall screen. Email the results to yourself to get a list of what you have used to correct the room. The Room Treatment module uses the concept of Sabines to estimate room decay times. When the actual live RT60 times are computed, we derive the average overall Sabines for the room, and then as materials are selected we replace the Sabines for the area of the room now covered by the new material with the Sabines for that material, using industry-standard octave band Sabine information provided by the manufacturer or from published data for the generic materials. This method will not be as accurate as using a full ray-tracing system and fully defining a room in great detail using a PC-based software program, but it will provide usable results very quickly.